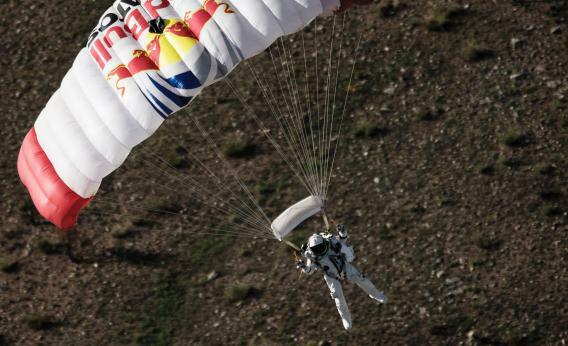 Felix Baumgartner: Red Bull-sponsored skydiver hopes to break sound barrier. On Monday, Felix Baumgartner, a 43-year-old Austrian, is planning to jump from a helium-filled balloon 120,000 feet above New Mexico. This is just shy of 23 miles above the surface of the Earth, one-third of the way to space, and will be high enough for him to see the Earth curve. Should his suit fail, his blood will boil. About 30 seconds into his fall, he will reach the speed of sound. If Baumgartner succeeds, he will break one of the longest-standing records in aviation: In 1960, Joseph Kittinger, a U.S. Air Force officer (and currently an adviser to Baumgartner), jumped from 102,800 feet. Baumgartner is one of the world’s foremost skydivers. He already claims the record for the world’s lowest jump, set in 1999 when he leaped from the famous statue of Christ that looms above Rio de Janeiro. Baumgartner has been preparing for this jump for the past five years, under the sponsorship of the energy-drink company Red Bull. It might seem odd that Red Bull is willing to attempt what NASA, the USAF, and other countries’ space agencies and militaries are wary of, but in truth Baumgartner is the latest in a long tradition of adventurers sponsored by private industry, without direct hope of corporate benefit (other than the creation of marketing goodwill). In earlier times, conceptions of branding being less entrenched, rich businessmen often paid for such stunts out of pocket, rather than from marketing budgets. Even if thrill was undeniably, then as now, the fundamental motivation, genuine scientific and technological value has come from exploits like Baumgartner’s. Llewellyn Wood Longstaff, a paint magnate from the north of England, helped fund the explorations of Robert Scott, who led five men to the South Pole only to come in second to Roald Amundsen and then die on their return journey in early 1912. Longstaff had jump-started Scott’s earlier 1901 trip to Antarctica on the ship Discovery, with 25,000 pounds* (about $3 million in today’s American money), which the British government then matched (along with another 20,000 pounds of private funds). The U.S. government has similarly chipped in to Red Bull’s effort, though in a more limited fashion—at least one government doctor is working on Baumgartner’s team, but semi-undercover, according to Esquire. Loel Guinness, a wealthy cousin of the eponymous beer fortune, gave the famous ocean explorer Jacques Cousteau the ship Calypso, on which Cousteau lived and worked for decades. Guinness retained ownership of the Calypso, but leased it to Cousteau for one franc a year. He wished to retain anonymity, though this led to a dispute after the ship sank in 1996. When an MIT-lead team obliterated the distance and duration records for human-powered aircraft in 1988 with the Daedalus, a pedal-powered featherweight, one of their sponsors was Shaklee, an obscure nutritional supplement maker whose name remains little-known, perhaps because the Daedalus team was reluctant to hawk the vitamins. A decade later, in 1999, when Brian Jones and Bertrand Picard became the first to fly around the world in a balloon without stopping, their mission was paid for not by an aviation company, but rather by Breitling, a Swiss watch-maker. Then, as today, many would, like Gregory, make such a distinction between adventure and science. But the line is murkier than many scientists would like to admit: Sometimes only daredevils like Baumgartner, tenured nowhere, will advance the bounds of human achievement, and thus knowledge. There is some circularity in Red Bull’s scientific aspirations: The company hopes to use information from Baumgartner’s feat to build better space suits and parachutes and “aid development of protocols for exposure to high altitude/high acceleration”—i.e., to make it possible for others to follow in Baumgartner’s steps. Future space tourists might one day have their lives saved by a descendant of Baumgartner’s parachute. Without Scott, Amundsen and other pioneers who made heroic sacrifices at high latitudes, humanity doesn’t get valuable climate and cosmological research at the antipodes. The scientific and engineering establishment is often loath to underwrite such risks. If fizzy-drink makers are the ones to do so instead, bottoms-up. *Correction, Oct. 4, 2012: This blog post originally said that Llewellyn Wood Longstaff gave 25,000 euros to Robert Scott’s expeditions. He gave 25,000 pounds.